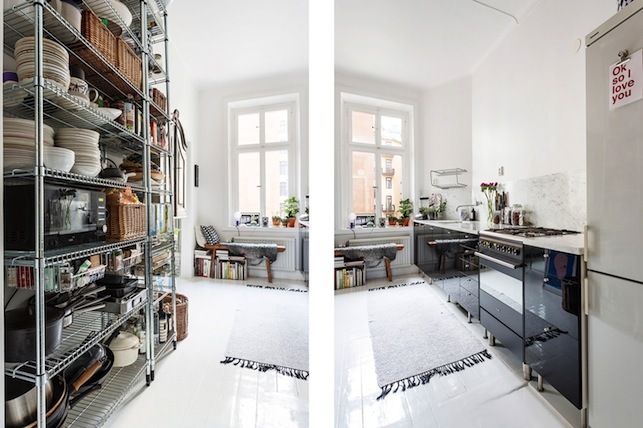 There are a few things about this Stockholm space that stand out. 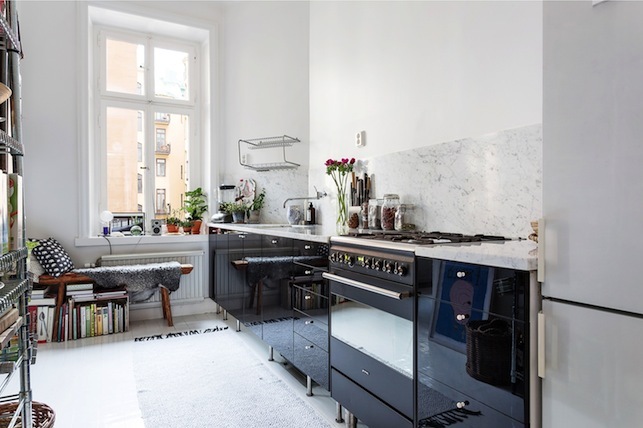 In the kitchen for example, I'm loving the black gloss units combined with light grey marble splash back / work surface and the cosy window nook - perfect for a pensive coffee break don't you think? Hello 'nook board'! I also like the striking library wall in the dining room. 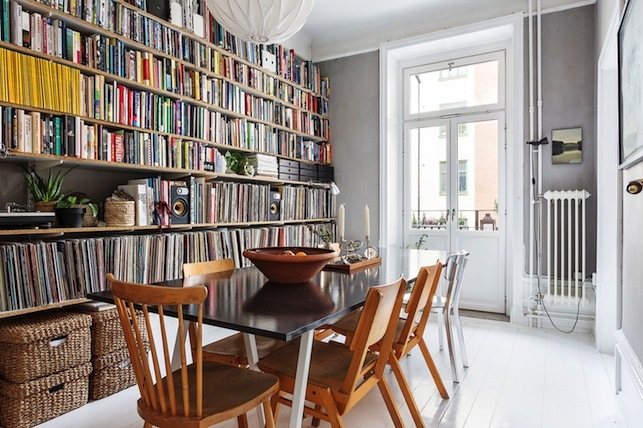 Sometimes dining rooms can feel a bit cold and formal, but the rows of books and LPs make this space feel so relaxed and inviting, at least in my eyes? 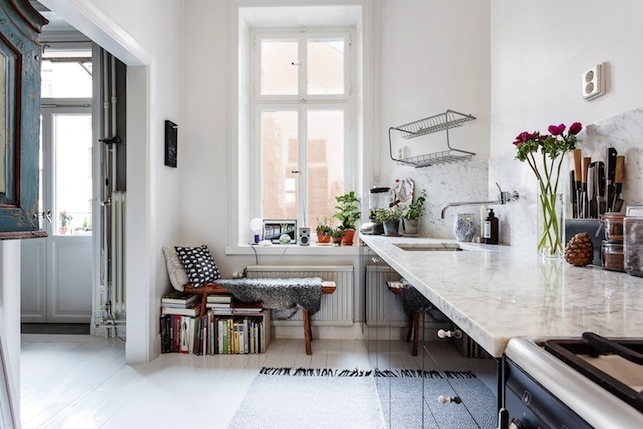 All in all, there's some great inspiration to be taken from this apartment, I hope you find something that inspires you too! Anything you noticed in particular? I actually mistook the blanket for stacked fire logs at first, do you think this was intended? 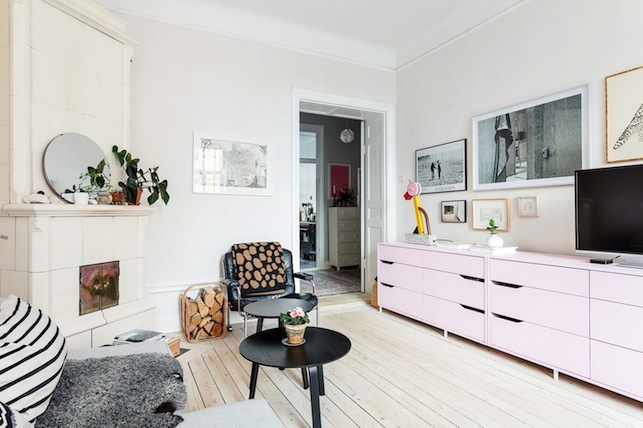 It certainly adds warmth to the room and sits nicely beside the traditional Swedish kakelugn. I love the dotty bedding too but can't find where it's from- any tips?! In my search I found this very cool IKAT bedding though- see it in action here. Great alternative perhaps?! 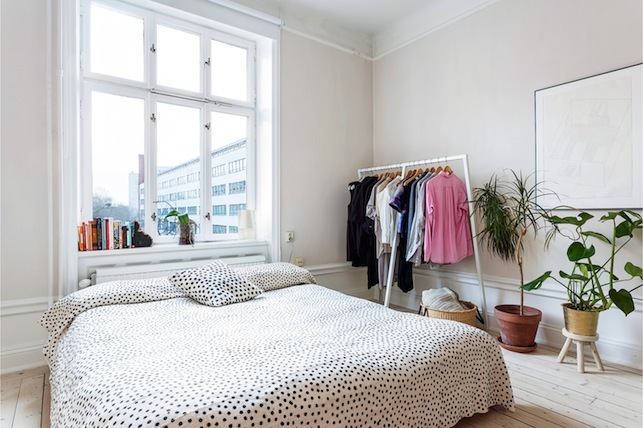 More fab bedroom inspiration for the perfect duvet day here, here and here. On an entirely different note, I've always loved Facebook and Pinterest. But this year I've also got totally into Instagram (@myscandinavianhome) too. I was never not there, but it was only recently I discovered the value in it and really enjoy discovering the beautiful images people post, are you on there too? If so, let's hang out! Hey! I fall in love with the sofa, anybody knows where I could found it? Thanks! I am really loving the fireplace in the dining area, but the piece that has really caught my eye was the amazing library! What an awesome space, I just love to be surrounded by books and magazines. Lovely. LOVE the pail pink! so subtle. I love the leather sofa. 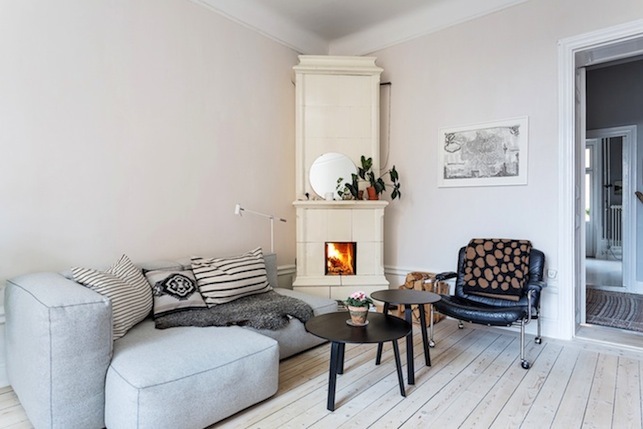 I noticed the same sofa in brown leather in another of your scandinavian homes..Any idea what it is called? Which brand?